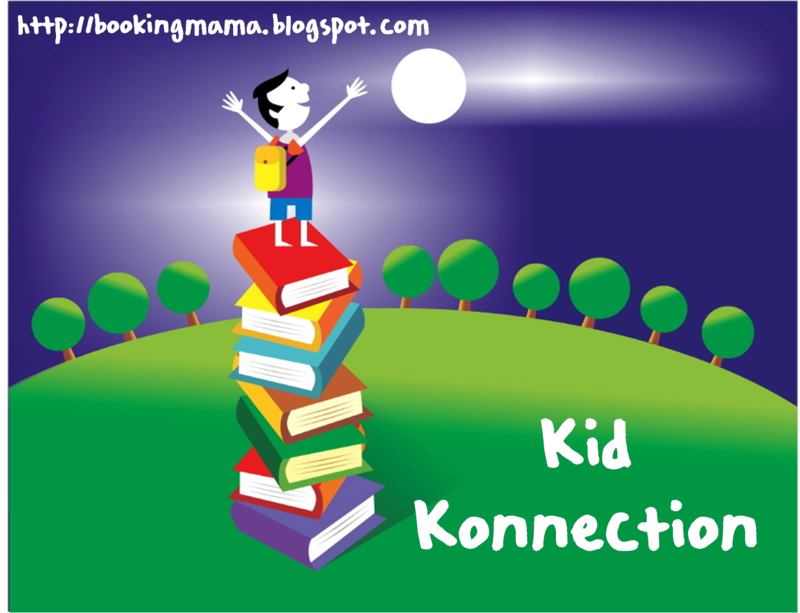 Every Saturday, I host a feature called Kid Konnection -- a (hopefully) regular weekend feature about anything related to children's books. Today, I am going to share with you some great new graphic novels especially for kids! Summary: Big Nate is in a class by himself! Nate barely survives his dad's toxic oatmeal before rushing off to school—minus his lunch. 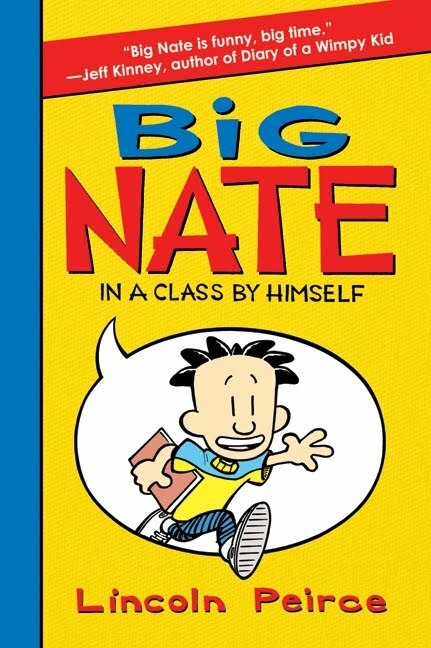 I have two words for BIG NATE: IN A CLASS BY HIMSELF by Lincoln Peirce -- LOVED IT! Before reading this graphic novel, I wasn't familiar with BIG NATE, but you might already know him as the comic strip character who appears in newspapers nationwide. One thing's for sure, now that I've "met" Big Nate, I won't soon be forgetting him. Big Nate is just a hoot! Nate seems to be one of those kids who is always getting in trouble. When he opens a fortune cookie and reads that "Today you will surpass all others," he is very excited about all of the possibilities! Throughout the course of the day, Nate keeps getting into trouble with all of his teachers and served with detention notices. Since he's having such a bad day, he clings to the hope that he is destined for big things! The ending of the book was pretty predictable but terribly funny nonetheless. In fact, I laughed the entire way through this book and so did Booking Daughter. The book is told in Big Nate's words and pictures, and I have to say that he is one hilarious kid -- I think he has a future in writing comics! His insights (and lack thereof) are extremely entertaining! Like Big Nate, author Lincoln Peirce began drawing comic strips back in the sixth grade. There is no doubt that he is a very funny person and has his pulse on middle graders. What I love about this book is that it appeals to boys and girls alike -- just like the DIARY OF A WIMPY KID books. And I think that kids who aren't big readers will still be drawn to Big Nate's adventures! There is a great website devoted to the Big Nate Books! There are links to interactive games and the Big Nate online comic strip. Fans of Big Nate are going to have a blast! I highly recommend BIG NATE: IN A CLASS BY HIMSELF! Both Booking Daughter and I thought this book was hilarious and we can't wait for the next one in the very fun series! Last summer, I reviewed the first two books in the Lunch Lady series by Jarrett J. Krosoczka. I thought they both were cute and perfect for reluctant readers. I recently read the latest book in the series, LUNCH LADY AND THE AUTHOR VISIT VENDETTA, and I'm happy to say that it was just as good as the first two. I love it when books live up to my expectations! LUNCH LADY AND THE AUTHOR VISIT VENDETTA is a graphic novel and very similar in format to the first two books. It is a very funny and action-packed story about a famous author who comes to visit the school. When the gym teacher goes missing the same day as the visit, Dee, Terrance and Hector become suspicious and the Lunch Lady ends up coming to the rescue! I love that these Lunch Lady books make reading fun for kids. There are lots of pictures and just a few words on each page so it doesn't take kids long to read these books. Not only will they enjoy the story, but they will also feel a sense of accomplishment when they can read these books on their own. I also think kids won't get frustrated because the words are relatively simple and the pictures do a great job of explaining the story. I really appreciate these books and I think most youngsters will agree. And, I can't wait to see the film version either. Universal Pictures is making a Lunch Lady movie starring Amy Pohler -- just perfect! Some of you might already know that Booking Son and I are huge fans of the Toon Books (reviews and more reviews.) We recently received BENNY AND PENNY IN THE TOY BREAKER by Geoffrey Hayes, and we thought it was extremely cute. Booking Son went so far as to say that he loved it! Brother and sister team Benny and Penny are back in THE TOY BREAKER. This time, their cousin Bo is coming over to play, and Benny and Penny are afraid that Bo will destroy all of their toys. (I know I remember hiding my favorite toys when a few kids came over, and I'm sure other kids will relate to Benny and Penny's feelings.) The three little mice have to find something to play together that makes everyone happy! THE TOY BREAKER is ideal for beginner/early readers. It's classified as a level 2 Toon book and it has a great mix of pictures and easy-to-read words. This book is also filled with lots of humor to keep the readers entertained as well as a cute message. As a mom, I just love that the graphics reinforce the story and that kids can use all of the adorable pictures to help them figure out the unfamiliar words. ZIG AND WIKKI IN SOMETHING ATE MY HOMEWORK by Nadja Spiegelman and Trade Loeffler is another terrific early reader book. The graphic novel tells the story of two aliens who fly to Earth in their spaceship. Once they land, Zig and Wikki encounter some animals including a dragon fly, frog and raccoon; and they end up receiving a mini-science lesson about them. I think kids, both boys and girls alike, are going to love Zig and Wikki! The characters are cute and funny, and their adventure is very entertaining. I like that the book is also educational because it teaches kids a few things about animals and nature. The publisher even claims that ZIG AND WIKKI is "the first science-based early reader comic!" ZIG AND WIKKI is considered a level 3 Toon book, and it is a little longer than some of the other Toon ones. It still has relatively few words per page as compared to the graphics, but it is divided into short chapters. I think it's just perfect for early readers, especially those interested in science! Big Nate was a hit at our most recent book fair. I didn't have a chance to actually see what all the fuss was about, but now I wish I would have. I DID read a graphic novel that my daughter bought called "Smile". Review is coming soon! I don't know who Big Nate is and now I feel like I'm missing something. I bet Vance would have loved graphic novels when he was younger. My 7 year old son LOVED Big Nate. At our last book fair, I was pushing all the Diary of a Wimpy Kid lovers to try it out. I'm taking notes on the other books you mentiond. I love Big Nate. I was so sad when he stopped being a comic strip. I'm happy to know he's a book now! Great post! I'm an education major with a language arts, focus and from the work I've done with students thus far I can definitely say that some kids really connect to graphic novels. They are great for visual learners, and help get students who thought they were uninterested in reading to pick up a great book. Thanks for sharing these!